Turkey Creek is a 4.1-mile-long (6.6 km) stream in Malabar and Palm Bay, Florida, United States. 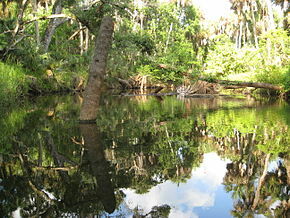 It is a tributary of the Indian River, with its mouth in the bay of Palm Bay near Palm Bay Pointe. This article about a location in Brevard County, Florida is a stub. You can help Wikipedia by expanding it. This page was last edited on 12 April 2019, at 12:08 (UTC).